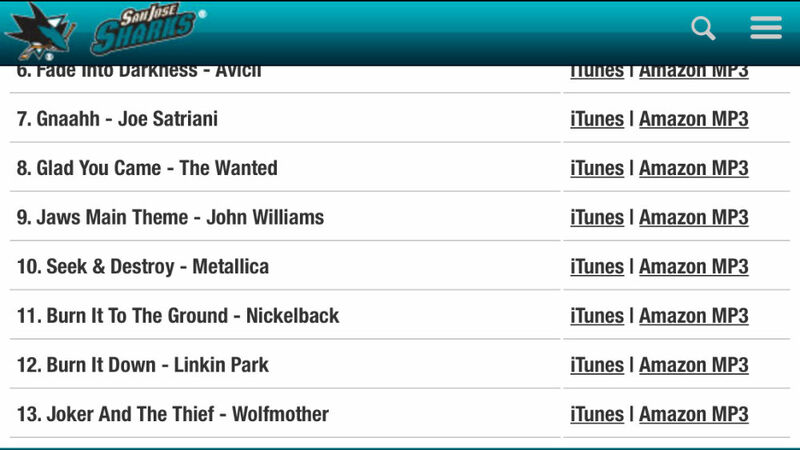 The playlist from a recent San Jose Sharks game at SAP Center arena. Ryan and I went for a walk Sunday. I wanted to get out of the house and get some exercise. He wanted to get some pizza. So we set out for the pizza parlor about 20 minutes away. Ryan grabbed his phone — and his headphones. Music has become his constant companion. On any walk, on any car ride, on any errand, no matter how brief, he takes along his phone, puts on his headphones and listens to his favorite songs. It helps him navigate. It helps him wait. It makes running any sort of errand easier. But, on this occasion, I told him to leave the headphones behind. Since we were walking together, I thought we might, you know, talk. He resisted and offered a compromise. He said he’d play his music at low volume so we could still hold a conversation. I thought about it, and quickly weighed having him accompany me with music vs. him probably not accompanying me at all. I took the compromise. On our way back home, he was looking at his phone, with his headphones in, while we held a conversation. The topic was hockey. Because, of course. We discussed the early part of the NHL season, and which teams were doing well vs. under-performing. Ryan was consulting the standings on his phone to bolster his arguments. Then he was looking at highlights. Then he asked me a question. “Dad, can you get me this song for my phone?” he asked. “It goes like this: err err err, er ERR errerr err” (you get the idea). We’ve had this conversation before. Ryan has a remarkable capacity to remember and repeat the rhythm of songs. Usually, I have no shot at figuring out what song he means. We have to wait until it comes on the radio. I even put the Shazam app on his phone to help him find songs he’d like to buy. The beat he hummed sounded vaguely familiar. He offered that he heard it during a recent Sharks broadcast. It was playing in the arena, in the background just as the game was about to start. I thought perhaps it was a Kiss song — certainly plausible for a sports venue — so I got out my phone and pulled up some of their greatest hits on YouTube. Ryan shook his head at each one I tried. Back to the drawing board. “Here, do you want to hear the song?” he asked. Turns out he had heard it in the background of a Sharks broadcast replay that he watched on his phone as we were walking. And talking. He gave me the earpiece. The song was barely audible in the background as the announcers went over the keys to the game just ahead of puck drop. But it was familiar — a current song I’d heard before but didn’t know the name of. It was too quiet for Shazam to identify, at least I thought so. Still, more clues. We knew which game and which arena had played the song. 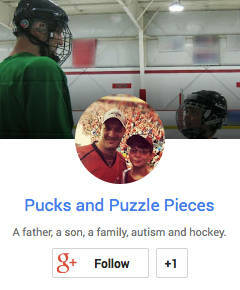 I thought Google might help solve the puzzle. Going back to my phone, I searched “San Jose Sharks playlist SAP Center” and got two hits on the Sharks’ official site. One was from 2012-13 and listed all the songs that were played at each home game. Right info, wrong time frame. Ryan was excited by the result, but when I told him it was from two seasons ago, he asked which date. So I told him and of course he replied with the opponent, the final score and the shots on goal total. I tried the other result. It was undated but I hoped it was from the most recent game, which was the one with the highlight containing our mystery tune. I clicked and found a list of a dozen or so songs. I recognized a few of the artists, but only one or two song titles. I’m not exactly up on pop music. I read them all to Ryan. He knew a few as well and was able to eliminate them right off the bat. That left us with about 10 songs to investigate. Using the iTunes Store app, I searched each title, then played for Ryan the 45 seconds or so sample. He shook his head at each. Frustrating, but this was actually fun. I was already envisioning the next step in our investigation when I clicked on the last song title. We both recognized it right away. It was indeed the mystery tune, “The Joker and the Thief” by Wolfmother. I immediately purchased it so it could be added to Ryan’s phone. We exchanged a high-five. I asked him what he thought of all the technology we used to solve the puzzle. He shrugged. I reminded him that when I was his age there were no phones that we carried around. There was certainly no way to watch hockey highlights in the palm of your hand. “But how did you listen to music?” he asked, inviting a lecture on a device called the Sony Walkman. He remained unimpressed. I think maybe he felt sorry for the deprivation of my analog age. “Technology is cool,” I said, finally earning an agreement. And with that, we reached our destination, with a song library that had grown by one. My walkman was red plastic – I thought it the pinnacle of cool, lol! I remember when I finally got one with “auto-reverse” …. what a concept!